DANE Trans Himalaya Tour 2013: Directors Cut Hammer Abenteuer! Royal Enfield - Lass mich von der Nabelschnur Mami! Bitte! Sehr gutes Video die eine Reise mit einer Rooyal Enfield von Indien nach Ladakh dokumentiert. Full DVD Available from www.classic-motorcycles.co.uk. 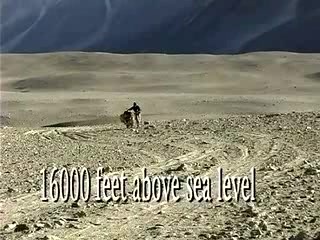 Award winning Riding Solo... is a film about filmmaker Gaurav Janis solo motorcycle journey from Mumbai to one of the remotest places in the world, the Changthang Plateau in Ladakh, bordering China. The film is even more extraordinary for the fact that Jani was a one-man crew who loaded his 200kg 350cc Royal Enfield motorcycle with over 100kgs of equipment/supplies and set off on a journey to one of the worlds most difficult terrains.